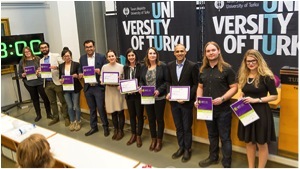 Thursday 9 March was an exciting day on campus, as it was the day for the final of the Three Minute Thesis (3MT) competition, which was organized for the first time at the University of Turku.The competition was developed by the University of Queensland and the first 3MT competition was held at UQ in 2008. The idea is that doctoral candidates introduce their research to the public as interestingly as possible in three minutes. I decided to participate because the event offers an excellent opportunity to practice presentation skills. It also helps to understand the essence of your own research when you need to explain it to others in three minutes. The competition started with two semi-finals in early February. The first semi-final was organized for the doctoral candidates within Humanities, Education, Social Sciences, Law, and Economics, and the other for doctoral candidates within Science and Medicine. From both first rounds five top presentations were selected to the final and I was honored to learn that mine was one of them. The 3MT final drew a large audience in the Tauno Nurmela hall. The atmosphere was full of excitement and it was very interesting to get to hear of other people’s PhD projects from different fields. There were also good prizes for the best ones. Moreover, the winner gets to participate in the Coimbra Group Competition with the video that was filmed during the final. Three best video recordings of the presentation will continue to compete in a live competition in Edinburgh in the beginning of June. In addition to the diploma all finalists received at the event, we all gained useful experience in giving a presentation and summing up our research. 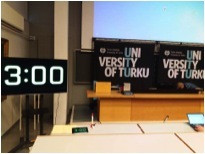 All in all, the whole experience was very positive and I hope that the University of Turku organizes this event in the future too. I encourage all doctoral candidates to grab the opportunity!